Our reporter Natalie Van Hoozer has been researching this topic, and she’s finding that it’s not that simple. 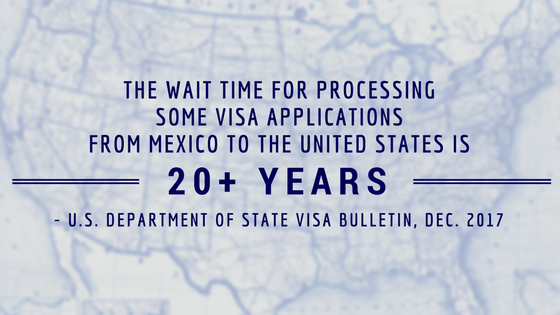 She sat down with our News Director Michelle Billman to break down the visa process. 2) When applying for a family-based visa, a U.S. citizen or a lawful permanent resident can apply for family in two categories: immediate relatives and those who fall into the preference system. There is no numerical limit for the number of visas issued for immediate relatives, which refers to spouses, unmarried minor children, and parents. For those who fall into the preference system, there is a total limit of 226,000 visas given out each year, for the whole world. This includes other family like the brothers, sisters, and adult children of the U.S. citizen or lawful permanent resident sponsoring the application. 3) According to the Pew Research Center, it is estimated that, as of 2015, there are approximately 11 million undocumented immigrants in the United States. According to a 2014 study by the Pew Research Center, there are 210,000 unauthorized immigrants in Nevada. That means 7.2 percent of Nevada's population is undocumented, which is the highest percentage for any state. 4) The time it takes to be granted a visa depends on each person's individual situation. Looking at the U.S. Department of State visa bulletin for December and using Mexico as an example, those in the first preference category are unmarried sons and daughters of U.S. citizens. The applications being processed right now for people in this group were filed in April of 1996. Natalie Van Hoozer is a senior at the Reynolds School of Journalism and works for Noticiero Móvil, a Spanish-English multimedia news outlet for Northern Nevada. The deadline for people to renew their Deferred Action for Childhood Arrivals status is fast approaching, and northern Nevadans are organizing legal help. KUNR reporter Natalie Van Hoozer has the story. There have been multiple local protests, including one in front of the Federal Courthouse Building and another on the UNR campus. A Reno church held a forum this week in partnership with local law enforcement and community organizations to cover topics for immigrants and refugees. KUNR reporter Natalie Van Hoozer has the story. All the seats in Ministerio Palabra de Vida were full, with more than 100 community members. For Pastor Cesar Minera, the location for the forum played a big role in the attendance.